Paris’ Hôtel du Ministère has just added a new penthouse apartment to its offering. 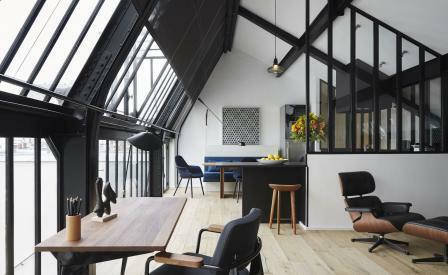 Evocatively named La Tête dans les Étoiles - ’head amongst the stars’ in English - its name becomes evident once you step into the roomy south-west facing living area, where a wall of steel-framed glass windows extend to create a skylight overlooking the romantic rooftops of the city and beyond. Designer François Champsaur’s interiors are a more understated version of his Mondrian-inspired themed downstairs, shying away from the graphic lines and primary hues, instead opting for chic blacks, greys and blues enlivened with splashes of bold colour in the two bedrooms. Meanwhile, his signature raw oak floor boards underfoot, create a textural base for sleek walnut wood furnishings, which along with the state of the art kitchen and a dining area that seats six, hint at the fact that the hotel owner originally designed the penthouse for himself. And just steps away from the Champs-Élysées, the hotel might be faultlessly located, but the once seated in the Eames lounge chair looking up at the stars, guests might find it difficult to lure themselves away.